Your wah pedal technique can be improved and refined in much the same way that you train your hands for better picking or fretting, and our workout can show you how. We're focusing on using the pedal in classic funk-style riffs inspired by Motown session ace 'Wah Wah' Watson, Charles Pitts' work with Isaac Hayes on the iconic Shaft soundtrack, and also more modern players such as Tom Morello, who fused funk and rock with Rage Against The Machine on tracks such as Bulls On Parade. 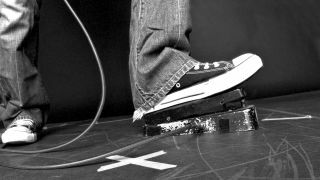 The basic operation of a wah pedal is to rock the pedal forward and back. The toe-down position opens the 'mouth' of the tone and the heel-down position closes it. You don't have to use the entire range of the pedal and it's often better to use a smaller range. We've provided four exercises that will test your skills. Repeat each exercise for three minutes without stopping and use a metronome to help you stay in time. Challenge your hand/foot co-ordination by increasing the tempo in small increments. We've played at four notes per click, but if this is too fast feel free to halve your speed and play two notes per click. Barre across the first, second and third strings at the 7th fret, applying and releasing pressure to alternate between the chord and the percussive mutes. Play the chords on the downbeats using downstrokes. Push your toe down as you play the chord and your heel down during muted notes. Play the barre at the 12th fret and stub your first finger up to the fourth string to mute it. If you can, curl your thumb over the neck to mute the bass strings. The rhythm is similar to Ex 1, but the chords are on the offbeat. Keep your heel down on the downbeats and toe down on the upbeats. Rather than rocking back and forth on the down- and upbeats, the idea here is to press your toe down on the wah each time you pick a full note. Even though the rhythms may be tricky, the fact that the unmuted notes coincide with 'toes down' makes them easier to feel. This riff uses three-string chord fragments, single notes and syncopated rhythms, all joined together. Practise it slowly at first, making sure you mute the idle strings for a clean sound. The wah should enhance the shape of the riff, so be sure to push your toe down for the right accents.